During the last five years, a new kind of approach to creating systemic change has been on the rise. The collective impact model. This framework calls upon different actors in the impact ecosystem – government, business, nonprofits, philanthropy, etc. – to collaborate in a structured way towards shared impact outcomes. In this article, we'll dig into why this model holds such promising potential for the impact sector as a whole, especially in terms of not just achieving better outcomes but scaling them as well. We'll also identify some of the challenges involved in taking this approach, and share a key cloud-based platform that impact organizations of all sizes and sectors can use to help make their collective impact models successful. 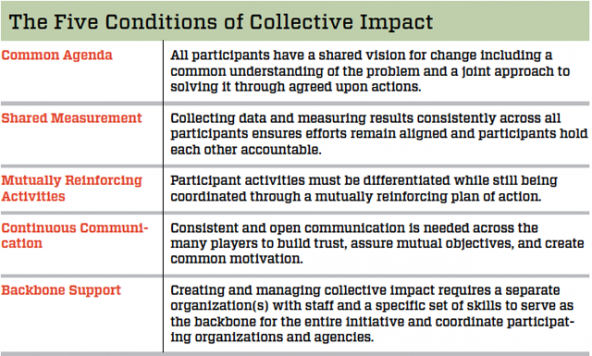 What is a Collective Impact Model? Programs often align by regional impact or the area of focus, and common goals should follow five core principles of collective impact: a common agenda, shared measurement, mutually reinforcing activities, continuous communication, and backbone support. The Stanford Social Innovation Review has a great series of articles exploring the nuances of collective impact partnerships. This blog will give an overview of the collective impact model to help give a sense of whether such structured collaboration may be useful for your organization in achieving the impact outcomes you seek. Why Use A Collective Impact Evaluation? It’s no secret that there are numerous organizations and programs aiming to solve the same (or a similar) social/environmental issues, or to benefit the same region or beneficiary group. Such alignment is the starting point for any collective impact collaboration. Another consideration for your organization is the social proof benefit. Entering into an agreement with a well-known (and well-perceived) business, government program, etc. can give your organization a credibility boost in the eyes of the general public, donors/investors, and even the beneficiaries you seek to positively impact. Gain powerful leverage to increase opportunities for government / public grants. Gain the power to lobby for beneficiary legislation by demonstrating that nonprofits are working where businesses do not and create socio-economic improvement. Better demonstrate meaningful and effective measures of the organization’s mission and vision. Of course, it benefits businesses or other players to partner with nonprofits as well, and not just for potential tax incentives. Nonprofits often have the best insight into the on-the-ground needs and context of the beneficiaries, as well as a long history working with them (this can help define better baseline data for a new program, for example). Read More: How to setup the groundwork for effective social impact measurement? Collective impact is one of the main areas of focus of FSG, a mission-driven consulting firm. One of the collective impact initiatives they helped implement took place in Staten Island. They brought together the Staten Island Foundation, law enforcement agencies, community organizations and leaders, teachers, teenagers, and more, in an effort to better realize impact outcomes for the Tackling Youth Substance Abuse Initiative. FSG helped organize these many stakeholders into various action-oriented steering committees which could leverage their diversity to create a better project execution plan, and then, actually execute it! You can read more about how they went about this, here. Nonprofits participating in collective impact programs often experience a mismatch in program objectives, beneficiaries served, and intended outcome(s). Hence, it is often best to start with programs that have collective areas of impact. For example, education in a specific community or region. Even after aligning organizations participating in the same programs, non-profits often do not have similar program metrics. For example, a collective program in education can be focused on pre-school, after-school, college readiness, children with special needs, etc. The general best practice is to create sub-programs and assign standard based metrics. Standard metrics provide a better measurement context with commonly known data collection processes. Simplifying the results of data collection and reducing the operative burden. While nonprofits may be willing to participate in the results collection process, the biggest challenge is to incentivize each of them to provide results that uniquely identify key indicators close to their mission and vision. Providing a large survey common to each sub-program participant can be quite counterproductive. It’s important to communicate the results across the different players, so each of them is not only motivated to continue Social Impact Assessment and sharing their results, but also they can understand their shortcomings and plan for improvement. It can be helpful to report collective impact through different tools to get more support from partners, communities, and funders. When there is evidence that an initiative is moving the needle both socially and economically, people are more prone to trust and support the cause. Read More: How can we improve social impact accounting? Given the needs of collective impact collaborations and the challenges noted above, to come together and implement such an initiative it is important to have the right data management (and sharing) tools. Provide data-driven insights to all your programs, grants and investments with built-in, flexible scenario with real-time updates when new results arrive. Flexible, comprehensive and easy to use. Provide an end-to-end life cycle from theory of change, integrated with standardized and custom metrics selection process, ease of data collection & analytics and integrated reporting. Results collection should not add a burden. Only collect results that matter most. Impact reporting should smartly deliver a qualitative and quantitative results composition with a smart impact learning summary. As a collective impact platform, SoPact Impact Cloud can simplify the process of setting up the collective impact programs’ Theory of Change, indicators, results collection process, results in analysis and results in communication through impact reports. To get you and your partners started, join our next webinar.